This resource presents four topics and nine activities related to the Earth's rotation. 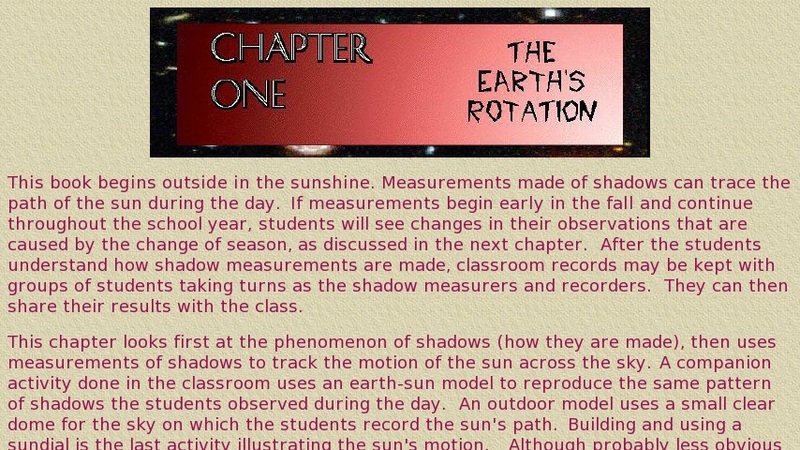 This chapter looks first at the phenomenon of shadows (how they are made), then uses measurements of shadows to track the motion of the sun across the sky. The activities challenge students to quantify their observations, and in so doing, learn useful measuring and organizational techniques. This is a chapter in the online book called Eyes on the Sky, Feet on the Ground, an exploration into astronomy as a classroom tool for learning how to theorize, experiment, and analyze data. The activities are fully illustrated and contain detailed, step-by-step instructions as well as suggested discussion topics.